Helen and Betty could not be more different in their perspectives of the destitute people that live around them. When Helen, the old sister, hears the story of the Good Samaritan she is rewarded for her classroom achievements, while the other sister chooses to live the example of the Good Samaritan. As Helen lives for herself and is constantly worried about the opinions of others, Betty searches for ways to be a blessing to others. When faced with the realities of living the life of the Good Samaritan, Helen reveals the treachery of her own heart as she mercilessly withholds good from a dirty street urchin. This is a story that reaches the heart, especially when you read how Helen responds to unexpected mercy and forgiveness she did not deserve. I have read a handful of books in your Lamplighter Rare Collector Series and have not been disappointed yet! My children loved each book we have read. 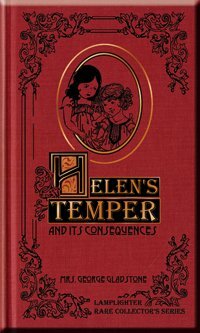 My all-time favorite has been Helen’s Temper. I have two girls who are very similar to Betty and Helen; this was evident after finishing the book, when one daughter shed an obligatory tear and the other cried for nearly an hour. It has been a great tool to remind them, as well as myself, to check our attitudes. Are we being a Betty or Helen? As a family we are enjoying each book tremendously. From Anonymous of Mission Viejo, California on 1/20/2015 . My kids (age 13 & 11) and I have enjoyed this very much. Easy to get into, doesn't take a while to get interesting like some books. Highly recommend.